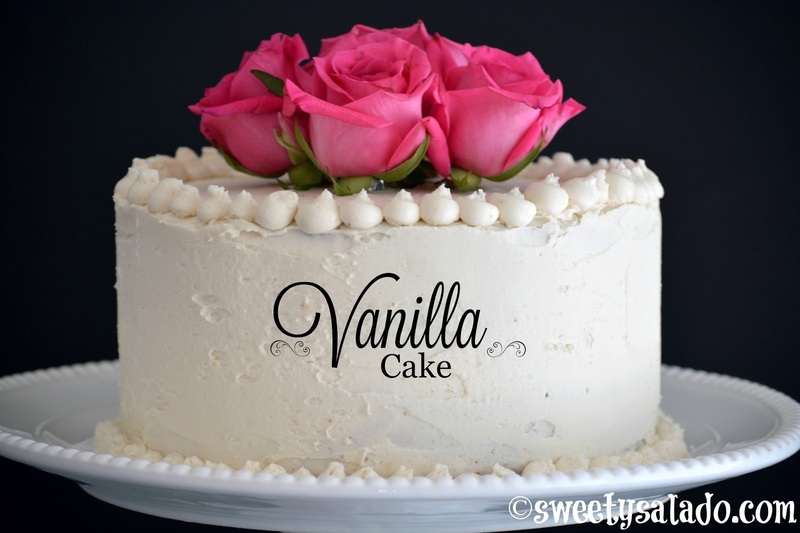 This homemade vanilla cake recipe is another winner that you can keep in your recipe box should you ever want to use it. There is absolutely nothing wrong with using a store bought cake mix, especially if you can find the boxes on sale because who can say no to that? I love the store bought versions because they are pretty much altitude proof, meaning that by adding a few tablespoons of flour and changing the baking time you can have a perfect cake at most altitudes, which is something that is very hard to obtain with any homemade version. However, homemade cake versions tend to be a bit firmer and that makes them easier to frost with almost any type of frosting. Plus, you can make them as sweet as you want. So, that’s why it’s always a good idea to keep a good homemade cake recipe handy. 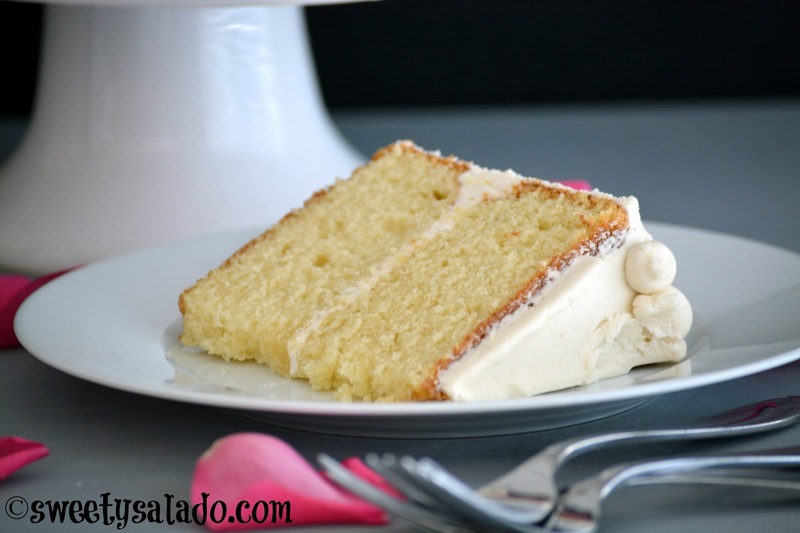 This vanilla cake, as basic as it is, is pretty outstanding. It’s not too sweet and the level of vanilla flavor is just perfect, which goes extremely well with vanilla or chocolate buttercream. So, I hope you try it at home and please let me know how it turned out. Sift flour, baking powder and pinch of salt in a large bowl and set aside. In a large mixing bowl, cream butter and white sugar at high speed for a few minutes until it's fluffy and reaches a pale yellow color. While still mixing at a lower speed, add the eggs one at a time and mix until each one is well incorporated. Then, add the vanilla extract. At this point you can scrape the inside of the bowl to make sure everything has been mixed well. Add the flour mixture in 3 batches alternating with the amount of milk, which will be added in 2 batches. Begin and end with the flour mixture. Mix only until each ingredient is incorporated without over mixing, otherwise, you will end up with a tough cake. Grease two 9 x 2 inch (23 x 5 cm) round cake pans and evenly pour your batter into the pans. Bake at 350ºF (180ºC) for about 30-35 minutes or until a toothpick inserted in the center comes out clean. Take the cakes out of the oven and let them rest inside the pans for about 10 minutes. Then, take them out of the pans and let them cool completely on a wire rack. 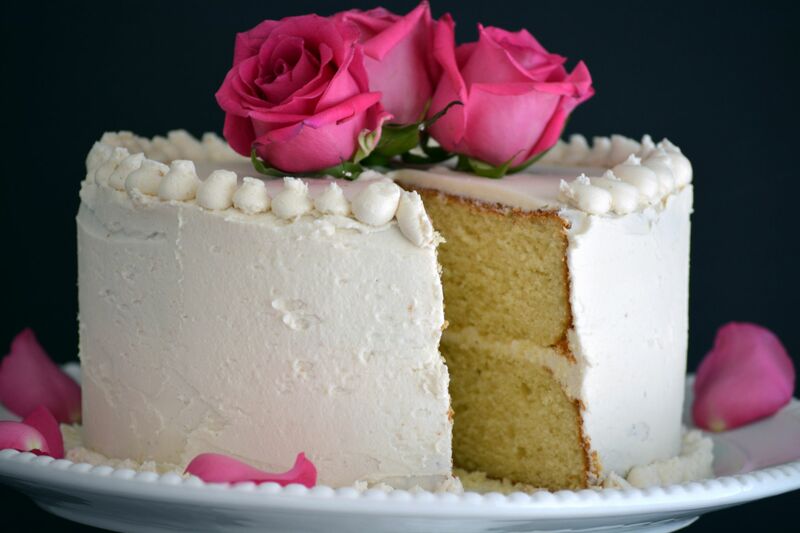 Once cooled, you can take off the top part of each cake with a cake leveler or a serrated knife to make them even. Frost the top part of one of the cakes with the vanilla buttercream (this is the bottom layer of your cake) and then flip over the second cake and place it on top of the first one. Now, cover both cakes with a thin layer of buttercream and refrigerate for about 15-20 minutes. This will be your crumb coat or base coat which will seal all the crumbs of the cake. Take the cake out of the refrigerator and finish decorating it with a second layer of buttercream. You can soak each cake with simple syrup before decorating it. You can make it by simmering ½ cup water with ¼ cup white sugar. You can also add 1 tbsp of any flavor that you want, like vanilla extract or liquor like Grand Marnier. I can't wait to try this! 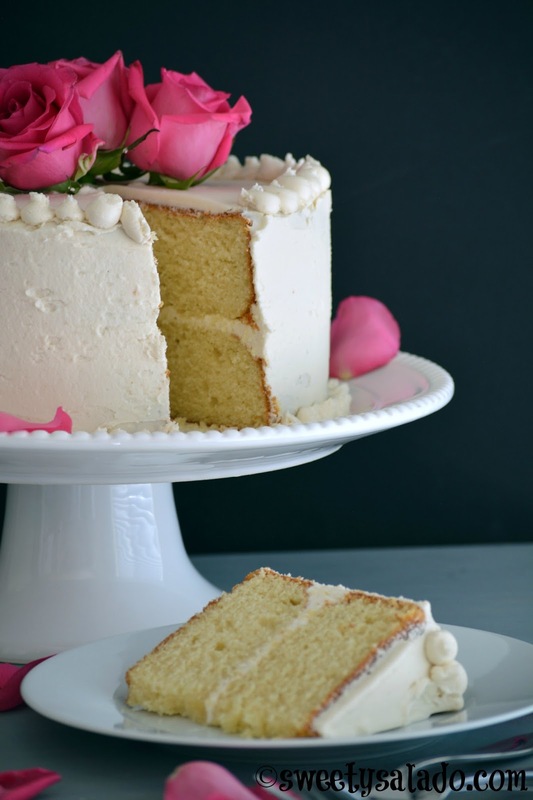 Have a birthday cake to bake today and this recipe seems super easy! Did it came out good? I want to make it too? Can I use 1 cup of sugar instead of 2? You could but I think it would come out a bit bland. Try with 1.5 cups and see if you like how it comes out.